Being able to cook a great steak is an important skill for men. If you’re having your family around for food or putting on a BBQ for your buddies, then you need to be able to cook a steak. And it’s even more impressive if you have an amazing ‘secret’ recipe. We won’t tell anyone that you found the recipe here. Just say you made it up. We’ve found the ten best steak marinade recipes around so that you can bring those beautiful flavors out of the meat and convince your friends you’re a world class chef. A lot of these recipes work best if you prepare in advance and leave them to marinate overnight. But, there’s also a couple of quick options if you don’t have that kind of time to spare. 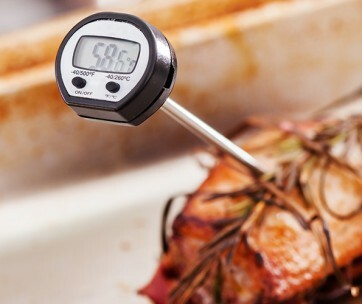 When you’re cooking a steak, you should use a meat thermometer to make sure the steak is ready to eat. Medium rare steaks will be around 135-degrees in the middle. The Italians know how to cook with meat. As one of the most famous culinary countries, they have a huge pedigree when it comes to seasoning. This classic vinaigrette dressing is subtle enough to let you still taste the meat, whilst giving it an extra kick. The only thing is that you have to leave it to marinate overnight, so you need to prepare in advance. Mix together the vinegar, olive oil, and rosemary. Put this marinade and the steak in a sealed bag and refrigerate overnight, making sure the marinade covers the whole steak. Take the steak out of the bag and season with salt and pepper. Heat 2 tsp of olive oil on medium-high in a pan. Grill for 5 minutes on each side, until it’s charred lightly. You can grill it on your indoor grill as well. Place the steak on a baking sheet and roast for about 30 minutes. Let the steak sit on a carving tray for 5–10 minutes. 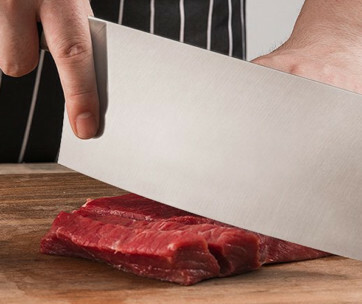 Use a carving knife to slice it and serve. Soy sauce is a classic ingredient when it comes to marinating a steak. The salty flavor is a great way of bringing out the flavors in the meat. You will see that soy sauce comes up a lot in steak marinating because it gives the meat a rich and salty flavor. One of the great things about this marinade is its simplicity. You just chuck in all the ingredients together and leave them for a couple of hours. That makes it the perfect marinade if you don’t have a lot of time on your hands or are cooking for a lot of people. 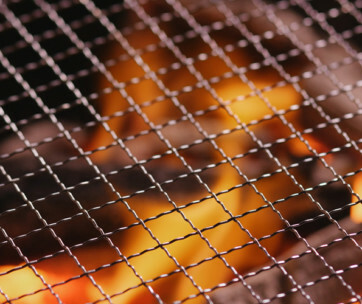 So take out that camping grill and get started. Put everything together (including the steaks) in a zipped bag and mix well. Remove the steaks from the bag and throw the marinade away. Grill on a medium-high heat for about 5 minutes on each side, until lightly charred. Red wine isn’t just for drinking with your meal, it’s also a great cooking ingredient. It’s used in a lot of Italian dishes and can also be used in marinades. We’d recommend using a mid-range red wine. You don’t want something too cheap because you’ll be able to taste it, but equally, you don’t want to waste an expensive bottle. Add all the ingredients (including steaks) into a zipped bag and mix well. Put in the refrigerator for 6 hours or longer if possible. Remove the meat and let it sit at room temperature for 30 minutes. Preheat grill to a high heat, lightly oiling the grate. 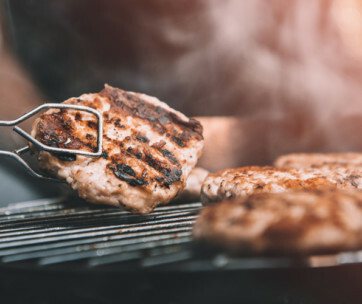 Place the meat on the preheated grill and cook for around 25-30 minutes, flipping every 4 minutes. The beef should firm up and still be a reddish pink in the middle. Place on a carving tray and let it sit for 10 minutes. If you’re a fan of Asian cuisine, then you’ll love this Korean steak recipe. It can be found in Korean restaurants all around the world and is normally served on a bed of white, fluffy rice. Some of the ingredients (like Asian pear puree) might be difficult to find unless you have a local Asian food market. If not, you can normally order the ingredients on the internet. If you want an authentic experience, you should eat this dish with your hands. Whisk ingredients and pour into zipped bag with steak, making sure the marinade covers the steak. Refrigerate for a minimum of 30 minutes (maximum of 24 hours). Place on a carving tray and let it sit for 20 minutes. Heat the grill to high heat. Cook on one side for 5 minutes, then flip to the other side for 3-5 minutes. Longer if you prefer it cooked medium-rare or well done. Cut it with your steak knife and enjoy the masterpiece. No list of steak marinades would be complete without a garlic and herb marinade. Garlic is one of the classic ingredients that can complement out the beautiful flavors of the meat. This marinade goes really well with a glass of red wine. Plus, it’s super simple to do. Once you’ve prepared all your ingredients, you just need to chuck it in the refrigerator and leave it. Then, cook the steak in any way you want. Add the steak and all ingredients into a zipped bag and mix well until the marinade covers the steak. Refrigerate for a minimum of 30 minutes. Ideally, you should marinate for 6-20 hours. Place on a carving tray or chopping board and let sit for 20 minutes. Cook on one side for 5 minutes, then flip to the other side for 3-5 minutes. Longer if you prefer it cooked medium-rare or well done. Ginger is another surprising ingredient that goes really well with steak. It works best when it’s combined with soy sauce and something to add sweetness, like honey or hoisin sauce. This takes the edge off the ginger taste and gives the steak a subtle sweetness, popular in Asian and Indian cuisine. Ginger also has loads of health benefits like reducing inflammation, nausea, and even pain. That means you can have your beautiful steak dinner and feel good about it as well! One boneless steak (16- to 24-ounce) or one bone-in steak (24- to 32-ounce), 1/4 cup soy sauce, 1 tsp minced ginger, 1/2 tsp peeled and minced garlic, 1 tbsp honey or hoisin sauce, ground black pepper, 1/2 lime (juiced). Turn the steak in the sauce once or twice. Alternatively, place all ingredients (including steaks) in a zipped bag and leave to refrigerate for up to 4 hours. Place the steak in the pan and cover with remaining sauce. Cook it on each side for 3 minutes for a rare steak. Cook for longer if you prefer medium-rare or well-done. Use an electric knife to cut the equal pieces and enjoy. Anyone that has been to Vietnam, and South East Asia in general, will know that they cook a little differently to us. Their dishes are often unbearably spicy for westerners and they use a lot of ginger. This marinade is a toned-down version of a Vietnamese marinade. The most surprising ingredient is the fish sauce. Fish? On a steak? Yeah, we thought that at first. But it actually works really well. Add the ingredients (including the steak) to a zipped bag. Refrigerate for a minimum of 30 minutes. Ideally for around 6 hours. Heat 2 tsp of olive oil on medium-high in a grill pan. Cook the steak for around 3–5 minutes on each side, until both sides are lightly charred. Add a squeeze of lime juice. Mustard is one of the great ingredients when it comes to marinating steaks. You have to be careful to make sure you don’t overdo it because the taste is so strong. Dijon mustard is great because it’s slightly milder than English or other French mustards. The rosemary and red pepper really work together with the Dijon mustard to create a taste sensation. 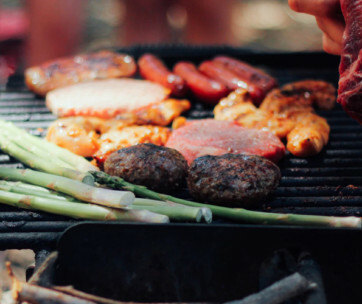 This is a perfect recipe for those who love to BBQ. Add the ingredients together and mix them thoroughly. Add the steaks to a bowl and cover with the marinade. Refrigerate for a minimum of two hours. Ideally leave overnight. Remove the steaks from the marinade and season them with salt. Preheat the grill and brush with oil. Place the steaks on the grill and brush them with the remaining marinade. Grill for 4 or 5 minutes on each side. Place steaks on a carving tray and let them sit for 10 minutes. Sweet and savory is one of the great things in life that shouldn’t work, but it does. It’s a really common flavor in Asian fusion cuisine and works with so many dishes, including steak. The brown sugar works with the soy sauce and Worcestershire sauce giving the steak an amazing deep flavor. This is a marinade that would work with any cut of steak but works best with a ribeye. Ribeye steak (2-pounds), cup soy sauce, 1/4 cup fresh lemon juice, 1/2 cup canola oil, 2 tbsp Worcestershire Sauce, 4 tsp brown sugar, 3 minced cloves garlic. Mix all the ingredients and add the steak, making sure the steak is fully covered. Refrigerate for a minimum of 6 hours. Lightly oil and preheat the grill to a medium high heat. Grill for 10 to 12 minutes, turning the steak once. Forget getting your fajita mix out of a bag, you can make it yourself easily enough. All it takes is a little time and preparation. This Mexican flavor can be easily achieved and will bring a real kick to your steaks, whether you eat them on their own or in a wrap. Add all ingredients to a bowl and whisk together. Add to a zipped bag and add the steaks. Make sure the marinade completely covers the steaks. Refrigerate for a minimum of 30 minutes. Ideally, marinate for 6 -24 hours. 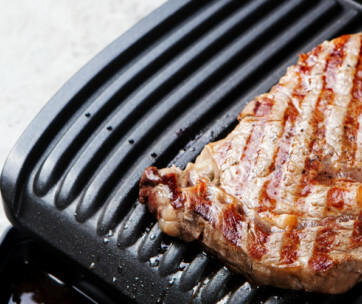 Place the steak on a carving tray for around 20 minutes at room temperature.